SHOE BOX- READY TO GO!!! A BOX LIKE THIS IS LESS THAN TWENTY BUCKS! Rising prices and economic hardship are being felt all over the world and that squeeze is being felt even more so in Belize. A significant percentage of the children in Belize live below the poverty line. As a result, when the family budget is under strain, the children are often the first ones that feel the pressure. The education of our children is at stake. How can we help? Children in Crooked Tree and Lemonal Villages are in need of school supplies. The average classroom lacks the basic essential school supplies that make for a meaningful educational experience for kids. 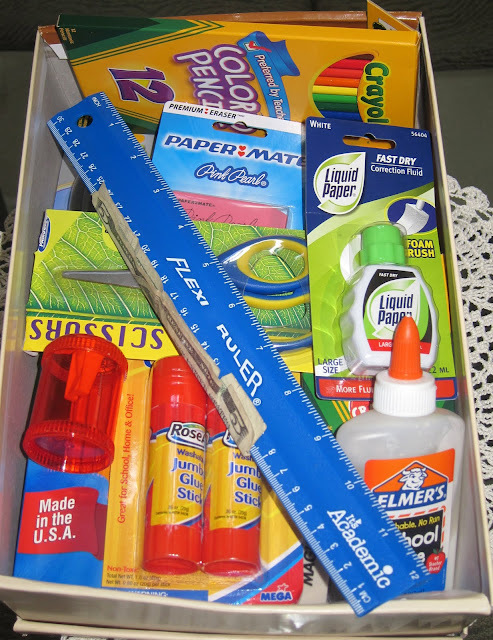 Often times the teachers have to buy these supplies from their own pockets. We can make a real difference by providing them with the essential tools they need. SHOE BOX; plus US$5.00 to cover shipping cost to Belize. On September 5, 2011 when our children return to school, the Crooked Tree Village Reunion, Family and Friends will present the supplies collected to our children. We believe that this will not ONLY put a smile on the faces of our children, but this will help to encourage our children to reach their fullest potential. EASY SHIPPING C/O Cherry Cadle and Emilio Mena who will receive your parcel/shoe box and deliver your donations directly to Crooked Tree Village Government School. Your gift will bless a child and their family. You now have the opportunity to make the difference in the life of a child by providing them with the essential tools they need. Simple things like pencils and pens can be expensive for a family or a single mother. Promoting a child’s education is one of the greatest thing a person can do. Please take the time to donate and help a less fortunate child. Your donations are greatly appreciated!! This is such a wonderful idea. My little boy who is 5yrs old already packed and ready to ship his box. He has the utmost sympathy for causes like this. Hello all, I a so on-board with this. Cherry, my box will be in the mail shortly. I will post at my job. Great Pam and thanks very much. Trust me, our kids need these stuff and they will surely appreciate the generosity of those who can help. MAZAL TOV TO NATALIE PORTMAN- ALEF! !